This 42-story condominium is designed by Robert A.M. Stern, who for at least 25 years, has been the New York area’s architect of revivalism. He has brought back the beloved Shingle style house in the Hamptons, and in NYC his apartments are meant to recall the elegant classicism of the 1920s. 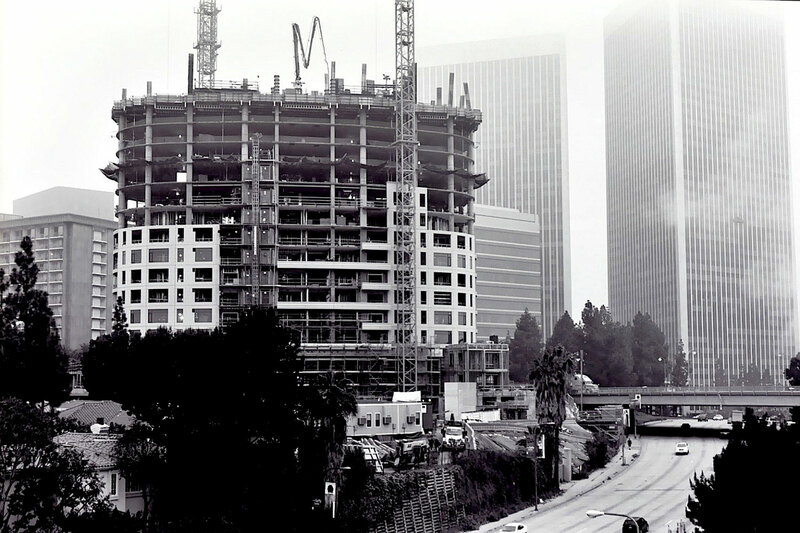 Strangely, this structure in Century City occupies a jaunty and asymmetrical angle with the two large office towers behind it, and the wide highway below. Yet, the architect will sheath this oval in a very formal, almost staid series of geometric columns. The initial excitement of the steel shape will be hidden behind a rather dour limestone cut arrangement of conservative design. Century City is the power center of Los Angeles, the place where all the mythology of the film industry has been deputized in the service of the esteemed professions of real estate, law, finance and retail shopping. In all these acres of offices, and now condominiums, I noticed that there is not one single park where people gather. Trees and benches are always behind gates and walls. Instead, there are widely landscaped medians, security cameras, and now a big luxury tower whose tenants will no doubt be absent most of the year as they live out their lives in Dubai, Hong Kong, Singapore, Moscow and Taipei. The world is coming together under one large corporate ideal. There’s a gathering place — it’s called the mall! ← Who Will Aunt Frances Vote For?